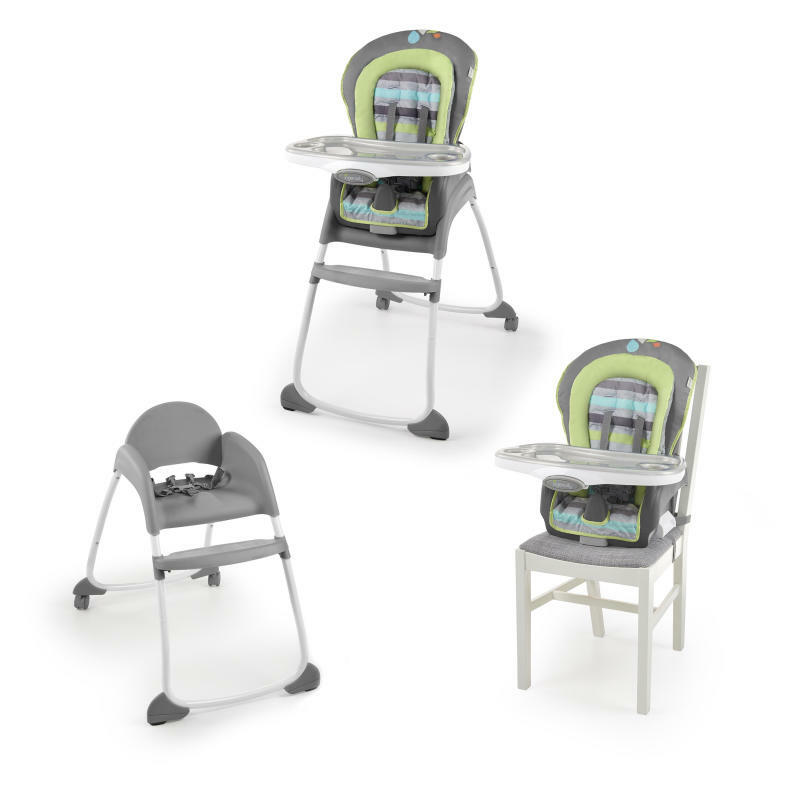 Designed with parenthood in mind.™ The Trio 3-in-1 Deluxe High Chair™ from Ingenuity™ is three great seats in one! This amazing high chair provides three different seating modes to grow with baby from infant to toddler: a full-size high chair, a booster seat, and a toddler chair. This is one chair that will grow with your family. Using both booster and toddler chair modes, the Trio can even accommodate two children at the same time! The EasyClean™ tray includes handy cup holders and is dishwasher-safe so baby can dine from a clean surface every time. The removable tray has 4 locking positions to adjust easily as baby grows, and removes conveniently with just one hand. For baby's ultimate comfort, the seat can recline in 2 positions and has a removable infant support seat pad. The Vesper fashion is a beautifully designed neutral color scheme that's perfect for both baby girls and boys, and looks great in your home. For portability, simply roll to your desired location and lock wheels for added safety. Seat pad is machine-washable. Tray is dishwasher-safe and features 4 locking positions to give baby growing room. Tray can be removed with one hand to make it easy on mom. Dimension (in) 34.5" x 21.5" x 43.5"
Seatpad - Remove from frame. Machine wash with cold water, gentle cycle. No bleach. Tumble dry, low heat.Bolster - Remove from frame. Machine wash with cold water, gentle cycle. No bleach. Tumble dry, low heat.Frame – Wipe the metal frame with soft, clean cloth and mild soap.Tray - Dishwasher safe. Wipe clean with a soft, clean cloth and mild soap.Tray Insert - Dishwasher safe. Wipe clean with a soft, clean cloth and mild soap.Harness/Straps – Machine wash with cold water, gentle cycle. No bleach. Air Dry.